“These courses represent critical transitions in mathematical thinking where students are challenged to ‘level up’ and move beyond the computational to the theoretical,” Russell explained. Dumbaugh and Russell note that more than half of all American students who begin in STEM fields drop out in their first or second year. 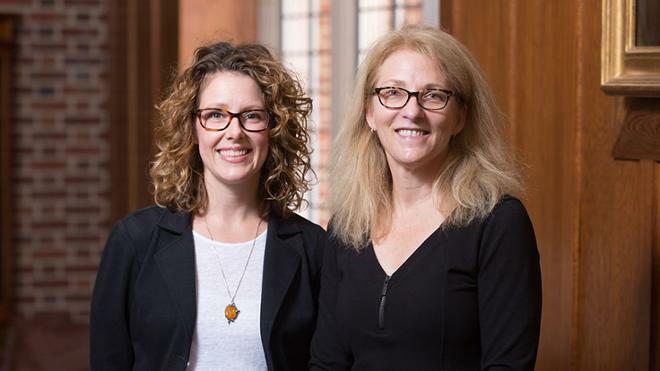 With a focus on mentoring, increasing confidence and strengthening core knowledge, Dumbaugh and Russell proposed strategies that create positive peer relationships for first and second year students and build confidence from the inside out within the broader community of women in mathematics at UR. For example, study groups will pair students with women mentors from previous classes. Dumbaugh and Russell hope this program will also serve as a step toward larger initiatives that broaden representation in math and STEM. This program is being funded through a National Science Foundation Includes “WATCH US” grant, which stands for Women Achieving Through Community Hubs. NSF INCLUDES is a comprehensive national initiative designed to enhance U.S. leadership in STEM discoveries and innovations focused on NSF's commitment to diversity, inclusion, and broadening participation in these fields. Dumbaugh, associate dean and professor of mathematics, teaches across the mathematics curriculum. She enjoys creating courses that cut across disciplines and schools such as "Science in context," an SSIR course that had students travel to Vienna. Her research lies in the history of mathematics, particularly in the fields of algebra and number theory. Dumbaugh received the State Council of Higher Education for Virginia's Outstanding Faculty Award in 2004. She joined the UR faculty in 1994. Russell joined UR’s faculty in 2015. Her areas of expertise include geometric topology, knot invariants, categorification, diagrammatic algebra, combinatorics, and graph theory. She is passionate about broadening representation in STEM fields.